Why Pressure Wash Before Exterior Painting? One question we get from home and business owners all the time is simply “should I bother with pressure washing before applying exterior paint?” Our answer is simple: That depends on whether you want your paint to last just a few years or a few years plus a few more. If you ask for quotes from 10 different painting companies, you will probably receive 10 different opinions on how best to prepare your home or business before painting. In fact, you may hear a thing or two that are in stark contrast to the things listed here. We offer you the most effective paint preparation techniques for the cost. While there are plenty of benefits to “prep work” – a term that can loosely describe a number of preparation techniques, but almost always includes pressure washing – there is really only one reason that it is considered to be a standard practice: Longer-lasting paint. It seems obvious, but painting a surface that has been exposed to the elements for years would be like setting your campsite on an uneven patch of ground: Uncomfortable, uneven, and much more likely to slide around. Pressure washing the exterior before painting removes the layer of dust, dirt, mildew, and more that has accumulated naturally over the years, exposing the old paint that will be covered up, which makes a strong bond for the new paint and, therefore, causes your investment to last longer. You’ll notice that above we didn’t say remove the old paint through pressure washing. While stripping off your current paint to expose the siding or wall beneath may seem logical, this isn’t actually a wise idea at all. There are certain siding materials that will require some stripping to create an effective paint job, but that should be seen as a separate step that comes after pressure washing, and usually is done only in isolated areas. 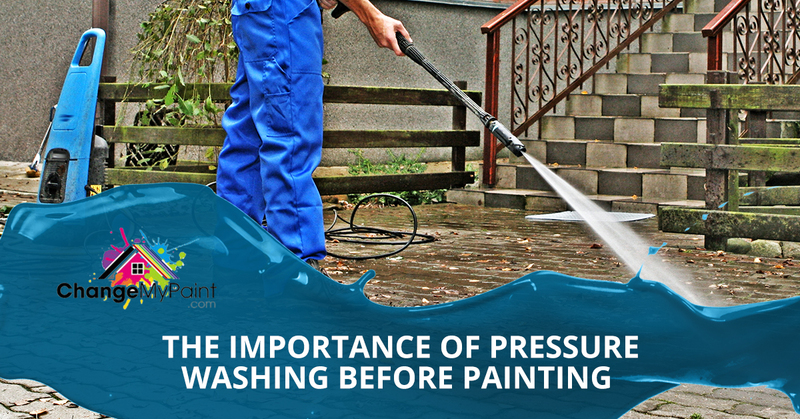 While a pressure washer can easily strip paint, it will likely take with it far more than just a layer of two of paint; any attempts to strip paint with a pressure washer will almost certainly leave lasting damages to the surface beneath that will not be covered up by a new paint job. If you’ve ever seen odd wavy dips in a wooden siding or deep canals carved into a brick or cement wall, they were likely caused by a pressure washer used by an untrained hand. Pressure washing, whether before a paint job or protect your home midway through the paint’s life, is not something you should trust to just anyone with the equipment – especially a DIYer; get in touch with Carolina’s most experienced and knowledgeable pressure washers instead. The team at Carolina Painting & Pressure Cleaning are well-versed on when and how to best use the power of water to brighten your world. Get in touch with us today to learn more about all of our pressure washing services today!